Continuing on a theme of “Invitational” Everglades paddling events, this year’s event was held within an area loosely termed the Bill Ashley Jungles. The trip was organized by contemporary Everglades explorer Terry Helmers of the Everglades Exploration Network. Terry likes to go well off the beaten path and plans these trips right at the start of the Everglades camping season, usually late October or first thing in Novemeber. He promises to never subject paddlers to a “brochure route” and always delivers! Paurotis Palm leaf is a very common sight in this part of the Everglades. As customary, the Invitational ran from dawn till dusk in the Everglades back country that very few ever get to see, let alone even know about! Route of the EEN 2014 Invitational from Paurotis Pond to “about” Hell’s Bay totaled up 11.5 miles of backcountry paddling! Unlike last year’s 2013 Invitational event which was all grass paddling, this year’s was all about mangroves and could be viewed as a continuation of the 2012 Invitational that started at Mahogany Hammock held in the same area. “Amazon” Bill and myself launching into the jungles off Paurotis Pond. Whether one could paddle or not in this country depended a lot on the choice of boat. Those with bigger, and especially longer kayaks had to walk more than paddle. For the most part I was able to stay in my boat, although I did have to get out and toss my boat over a few spots. The combination of my 15ft x 22 in wide highly rockered kayak and a short Greenland “storm” stick paddle worked out very well in this type of terrain! The “Widowmaker” means pushing, pulling or throwing boats over mangroves when necessary! It’s times like this that make for the best selfies!! This may look like a mangrove conference, but we’re actually “paddling” the “Widowmaker” stretch here! You can see that the mangroves are only 4 to 5 feet tall, so that once you stand up, it’s easy to see further ahead. The “Widowmaker” section was actually scouted out in a previous paddle and documented in this video by canoeist Jay Thomas. Terry Helmers is nearly camouflaged within the mangrove jungle of the “Widowmaker” in this aerial dragonfly view. Welcome to the “Widowmaker” says Terry as he directs traffic! These low altitude aerial views really show off the mangrove maze that we went through. It kind of reminded me of playing Pac-Man in slow motion! Dragonfly aerial view of the “Widowmaker” maze of mangroves. “St. Toby” aka “Whitecaps” in the Bill Ashley Jungles of Everglades National Park. He’s a real swamp angel! It was his first EEN Invitational and he ran it with this race proven kevlar Kruger canoe. Once through the “Windowmaker” section, the going got easy enough that we could all get back into our boats and just paddle the rest of the way on a so called “Flamingo Trail”. This also allowed me the freedom to do some more photography..
Timeless and endless mangroves, mangroves and more mangroves! Interesting textures and forms of epiphyte pseudobulbs! A Bromeliad airplant in the Everglades. Flora of the Bill Ashley Jungles. 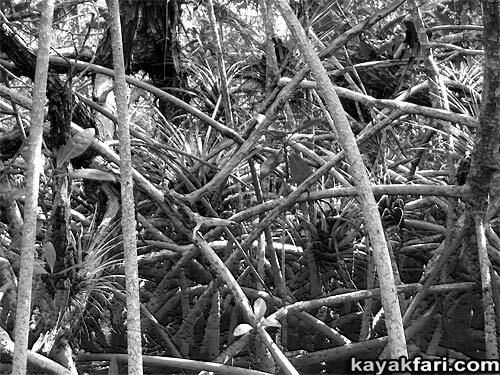 Paurotis Palm – one of the most common plants found in the Everglades! Everglades mangrove prairie and hammock tree island circa 1919. The Bill Ashley Jungles is an area west of the main Park road roughly between Paurotis Pond and Hell’s Bay, and we were right in the middle of it! Historically these were productive hunting grounds for both Native American tribes and later “Cracker” gator hunters and trappers. This landscape has also changed over the decades, with brackish water intruding northwards, resulting in the predominantly wet mangrove forest habitat that we saw. It certainly did not look like it to us, but back in the 1920′-30’s there was abundant game deer to be had here! Today this is a largely forgotten area, except for the Hell’s Bay Canoe Trail that runs through a part of it. Because of this single trail (probably the most popular paddle route inside of Everglades National Park), the area is paradoxically at once the most visited, yet the least explored. Seminole Native Americans poling their cypress dugout canoes in the 1910’s. The Bill Ashley Jungles were named after a band of outlaws who hid out in the Glades in the 1910’s-20’s called the Ashley Gang, led by John Ashley and his “queen”, Laura Upthegrove. Back then almost everything in South Florida was still the “Everglades”, so whether you were in Homestead or Jupiter, you’d still be in the “Everglades”. It was more of a question of how hard it was to get in and out. By 1924 members of the close knit Ashley Gang family were either in custody or dead (or both, according to some accounts!). Bill Ashley, one of John’s brothers was apprehended in January 1924, and was the only one who actually survived the family “business” and then lived out his years in Pompano Beach until his death in 1940. The outlaw Ashley Gang in the early 1900’s. Before there was a War on Terror or a War on Drugs, there was a failed War on Alcohol called Prohibition (1920-1933). In a similar way that today we might see makeshift drug labs “meth labs or crack houses” hidden within our (sub)urban jungle, back in those days there were dozens and dozens of clandestine moonshine operations stashed throughout the real jungle. Bootlegging and Rumrunning were staples of the Ashley Gang, however moonshiners continued to produce illegal and un-taxed home brew liquor into the 1950’s-60’s in some areas. Here’s a fascinating account of a visit to an old moonshine camp in 1949! Moonshine whiskey liquor still in the eastern Everglades during Prohibition, circa 1925. There may still be remnants of old moonshine camps waiting to be found, but the whole area has burned repeatedly after several hurricanes. Also, the widespread practice of making “burns” was successfully used for decades in the Everglades, further reducing the chances of finding anything today. This was Totch Brown’s country, a famous and sometimes infamous Gladesman who lived his life out in the Chokoloskee area. His autobiography is really an excellent read: Totch: A Life in the Everglades. One of the reasons this area was favored for moonshine camps is that most were positioned on tree islands within less than a mile from the main Park road (then called the Ingraham Highway), which meant easy transportation to Miami. If there was too much “heat” in Florida City, liquor could be moved along via a different route. In fact the original “Whiskey Creek” which used to run through the Bill Ashley Jungles, was aptly named and enabled transport on a trail that paralleled a so called “reef” line to the east of the Park road, and exited out into Madeira Bay. 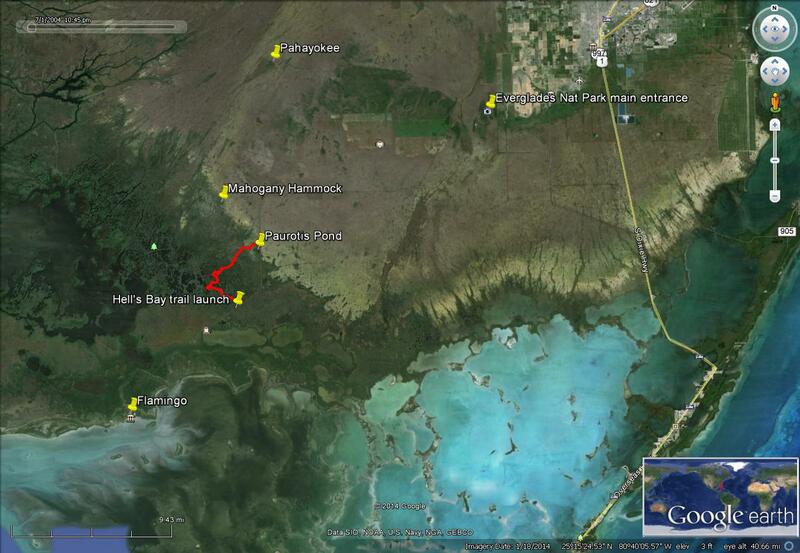 From there it was easy to reach US 1 by paddling east on Florida Bay. Today the “reef” line is long overgrown, however sections can be explored on the Craighead Pond Canoe Trail east of Nine Mile Pond in the Park. Mangroves are nearly impossible to get through on foot and thus make a great natural barrier. Incidentally, also on the east side of the Park road is the Noble Hammock Canoe Trail, a short but pretty three mile loop. It was named after Bill Nobles who ran a moonshine still operation on a hammock back there during Prohibition. The trail is just a small section of Still Creek which runs down into West Lake and is well worth seeing! Mangroves – the legendary “walking” trees. I stuffed the whole of Everglades into a Lard Can! Paddling through mangroves and time in the Everglades .. Continuing along past an intersection of the old Whiskey Creek, we were now on the so called “Rattlesnake Trail”. We didn’t see any snakes nor alligators, but we did see “a wildlife” .. or two, in the form of birds – a Heron and an Egret. Back in the day, Alligator hunting for skins was a way of life for many Gladesmen, and one of the reasons they’d be out there in those remote camps. An engraving from 1591 depicts Native American Tequesta or Calusa “savages” hunting alligators akin to slaying of fabled medieval dragons as per European attitudes of that age! Alligator hunters among black mangroves in the Everglades in 1882. One of the more famous of gator hunters and Gladesmen was Glen Simmons, who spent much of his time in the Everglades. His biography “Gladesmen: Gator Hunters, Moonshiners, and Skiffers” is a must read for anyone interested in what life was really like back then! Glen was also famous for his skills at building Glades Skiffs, which themselves were modeled after similar Native American cypress dugout canoes. Glen Simmons spent most of his life hunting and trapping in the Everglades. A true Gladesman, here he is poling his Glades skiff in the 1990’s. Meanwhile, back in the Bill Ashley jungles, a different kind of hunting and trapping went on all around us! Innocent looking purple and yellow flowers on the surface of the water were actually the flowers of the carnivorous Bladderwort plants that trap tiny creatures into submerged bladders. They were all over the place, often above mats of Hydrilla and interspersed with lots of Periphyton or “Everglades Cheese” as I call it. Bladderworts trap and eat small aquatic creatures with their submerged bladders. Beautiful flower of the carnivorous Bladderwort. The big sky in the Bill Ashley Jungles. Susan just loves paddling her lightweight solo canoe! It was good to see so much Periphyton all around, it means that the water is fairly clean! Leah triumphantly steers Bill clear through a tight Everglades “switchback”. ‘Cause if you don’t – well we all know what happens next! A traffic jam pileup in the Bill Ashley Jungles of the Everglades. Paddling in the reddish, dark tannin, tea colored trails. An above and below the waterline composite photograph! Mangrove leaves turning into Everglades “tea”, rotting on the bottom underneath the mangrove roots. Canoeists Susan Sylvester and “Amazon” Bill in the Everglades. Leah enjoys paddling the Everglades with her Greenland stick! At this point you might ask, but where is my Lard Can? A Lard Can is an all purpose storage container, much like a 5 gallon bucket with a tight fit lid. Sometimes also referred to as “suitcases” back in the day, they were either re-purposed after using up the lard or acquired new. They were used exactly like today’s drybags to hold anything and everything and keep it dry in the Everglades! They fit nicely into the Glades Skiffs or “Pit Pan” gator boats of the time! Marker buoy for the Lard Can backcountry campsite. Lard Can is an official Everglades National Park backcountry campsite that also happens to be the closest to the main Park road and is thus the first stop on the Hell’s Bay Canoe Trail. We, of course didn’t arrive via any official trail, and in fact did not see any tourists at all! We took about a half hour for a late lunch there. It gives a good impression of a “land” camp in the Everglades, but is often muddy and probably not one the most desirable campsites! At the Lard Can campsite, which is basically a large wet and muddy clearing with a small dock. I used my stout Greenland “storm” stick, a short version of a regular Inuit paddle. It worked great in the tight confines, much like a canoe blade. In the open stretches, I worked it with a sliding stroke. Elevated view of kayaks and canoes rafting up for a break. Paddling into a headwind in the Everglades, bird’s eye aerial view. On the way in the Bill Ashley Jungles, but where is the Lard Can Trail ? Esther Luft and her colorful euroblade vs Leah’s custom stick! Dressed for battle – going in! After our Lard Can visit, we continued along on the so called “Lard Can Trail” which roughly parallels the Hell’s Bay Canoe Trail in that section. As you can see, some sections were very tight to get through! Susan prepares to run a tough section of mangrove canopy. I would call this “Roots Paddling”, yeah! Look straight down into the Lard Can! It looks empty, right? Yet we know that there is much space to be found within! Care to go down the rabbit hole, if you dare!? Eventually this tight trail allowed us to exit back into the 21st century just north of the official Hell’s Bay entrance on the main Park road! Hand to hand combat in the mangroves that always want to grab and pull you back in! Roots paddling among the mangroves and creeks..
A Technicolor pullout onto the main Park road next to culvert 128, and a fine exit it was! Packing up in the late afternoon sun. Sunset over the Bill Ashley Jungles and the 2014 Invitational paddle. Click for 2014 Invitational Paddle discussion and more pics on the EEN forum! Sue Cocking was once again in the lead canoe with Terry Helmers and wrote her account for the Miami Herald. A BIG thanks to Terry and the Everglades Exploration Network crew for continuing to lead the way in contemporary Everglades exploration! 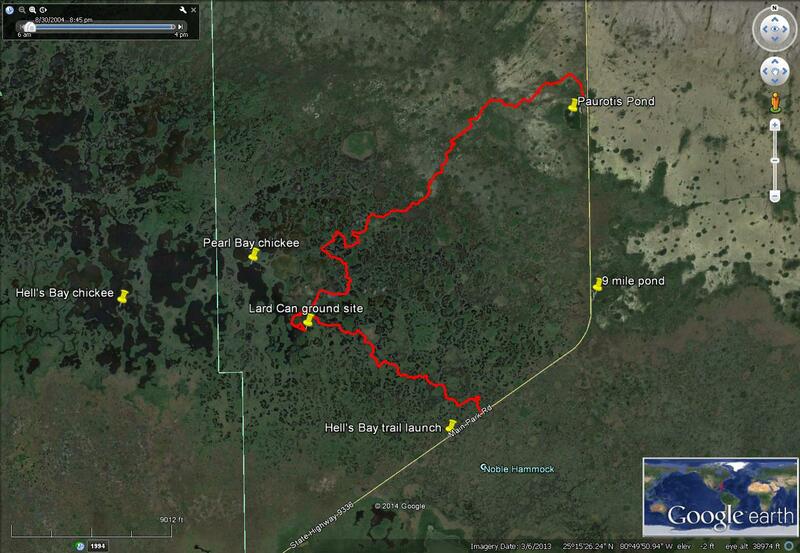 EEN 2014 Invitational route in relation to Everglades National Park. Always enjoy seeing your shots from your explorations Flex! Flex, you do good work! Fun and enlightening read. Nice to enjoy such a fine day over again and see so many different perspectives. Thank you! You did an awesome job documenting with words and images a very cool trip. You have a gift. And I learned things I did not know. I particularly like the juxtaposition of the images of the moderns paddlers and the Seminoles and old-time gladesmen. The historic background really brings out the life style and mystery of those gangs and gladesmen from the days of bootlegging and moonshining.